I thought the breakthrough in natural language would come through games - I was wrong, it’s come through mobile. My son’s friend has a new iPhone and asked, “What is the meaning of life?” It answered, “Chocolate”. Rude requests get “I’m not that sort of personal assistant”. Good to see that Apple still has a sense of humour. 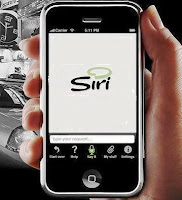 But it will be the serious applications that will drive Siri. Voice recognition is not new, Android have had it for ages, but it was seen as something to use when driving. This is a good thing, and undoubtedly saves lives, so on this advantage alone, Siri has a head start. But Siri is different. It may become as common as people using earpieces, odd at first, then annoying, then mainstream. The problem with mobile conversations is that the person can’t see the environment in which the other is talking, so it gets awkward; secondly people tend to talk too loud as they can’t overcome the natural brain response that you’re talking to someone at a distance. But the fact that Siri senses when you’ve lifted the phone to you ear is wonderful. So what’s a natural language interface’s potential in learning? E-learning usually puts something between the learner and content – a device. It can be a keyboard, mouse, touchscreen, joystick… whatever. This physical device requires cognitive effort and almost certainly distracts and diminishes the cognitive bandwidth available for attention and processing by the learner. Ideally, there would be no such device. Voice is, in fact, how most everyday communication takes place. We see and speak to each other without any interloper. You didn’t have to learn to speak and listen but you did have to spend years learning how to read, write and use computers. It’s good to talk as it’s how we learn. This has HUGE potential. The problem with much e-learning is the linear, over-structured approach that lacks the flexibility to respond to personal learning issues. These may be; getting stuck, not quite understanding a point, needing more information, needing more depth, wanting to know why and so on. The learner is an individual and needs variance in response. Siri may turn out to be the ancestral Lucy that leads to systems that really do provide powerful, personalised, adaptive learning. Going one step further, Siri-type coaches may help you resolve things or lead you through a learning process with prompts that suggest alternative sources, strategies and solutions. The Siri voice is already a calm, slightly robotic but friendly, coach-like voice. ‘PersonaI assistant’ is only one step away from ‘coach’, and I can see it being a coach for real, when the software becomes really AI driven. We’ve known since Ebbinghaus, in 1885, that we forget most of what we try to learn and that the cure for this rapid and inevitable forgetting is reinforcement and practice. Siri, or sons of Siri, could offer the promise of prompts, reminders and practice that really does push knowledge and skills from short to long term memory. It’s something that you carry with you and ideal for spaced practice. Learnosity has pioneered the use of mobiles in language learning. You do your homework or assignments as voice and get them graded online. Imagine using the language you’re learning and getting immediate dialogue and feedback from Siri in that language. They say the best way to learn a language is to get a foreign girlfriend, well this is the next best thing, a personal assistant. Backed up with regular prompts, as in the previous point about reinforcement, and you have a powerful, semi-immersive, language learning system. Numeracy remains a stubborn problem in education, with millions failing to pick up even basic skills. Here’s a way of making that dull stuff dynamic. You talk to the phone, and it takes you through maths using natural language. You answer with voiced answers. Analysis of your answers prompts positive feedback and a reasonably constructed system will know your personal level of competence, so you don’t get left behind and progress at a rate that suits you. Siri, unlike most maths teachers could be an expert, constructive, consistent and infinitely patient. Learnosity have already used voice for assessment, but the principle of voiced answers, checked by a language recognition system has fascinating possibilities in all subjects. It also allows you to assess people who have problems with written language e.g. dyslexia or physical disabilities. In any case, all those written exams taken by kids who don’t use pen and pencils in real life is rather odd. If you ask someone a question you expect a verbal reply. This could be the answer to remote assessment. Is this a breakthrough or false dawn? To me it feels like a breakthrough, as it could change a basic behaviour, allowing the device to do things traditional teachers do well – talk to you, give you answers to your questions, help you progress. It’s a breakthrough because it’s part of the consumer electronics revolution and hasn’t come from the educational world (where breakthroughs are rare), that means it has a chance of succeeding and becoming mainstream. I'm not saying that Siri in itself is the breakthrough, but it's the hole in the dam for natural language computing. Most of all, it’s cool and interesting. The Siri sites showing ‘fails’ and Siri talking to Siri, have already gone viral and viral is what we need in learning. I wonder how good the voice recognition is on the iPhone 4S. Every time I've tried to use voice recognition on anything else I've ended up throwing the device against the wall out of frustration. I have to admit I've not had the chance to use Siri myself, but I get the sense that although it's a lot better than it has been in previous applications, it is far from perfect, especially in crowded/noisy spaces. And it seems that it has particular problems with a Scots accent! http://www.bbc.co.uk/news/uk-scotland-15475989. But I would anticipate this will improve over time. I'm sure it's not perfect, but the start of something big. On Scottish accent - watch this - it's hilarious. So let me get this straight ... Siri is an improvement on e-learning because it acts less like a machine and more like a human? Almost like a teacher in fact? So why on god's green earth don't we just stick with a human teacher in the first place??? Why are 'anonymous' posts always the dumbest. Siri is thousands of times CHEAPER! Your argument is akin to saying why do we want books when we have people who could write them out individually on parchments using quill pens. I wouldn't want to suggest for a moment that Siri replaces a real teacher - however much cheaper it might be. However real teachers are sadly not available anywhere, anytime, all the time, so that's where Siri comes in. What we do need to do though is to consider what is potentially best delivered by a real teacher, and what could be left to Siri to provide. I sort of agree, but this is not about 'replacement'. Teachers are fine but teaching is not a necessary condition for learning. Hardly anything I've learnt in the last 30 years has been via a teacher. Siri simply offers scalability and powerful functionality 24/7 - something a teacher can never do. One of the pressures most corporations and government organizations face is the constant need for training, mostly because newer versions of software, and of operating systems are always making their way to the desktop. Companies wrestle with trying to stick-handle competing priorities, such as how to schedule employees into the learning cycle, while backfilling their positions and ensuring that customer service remains constant. And then there's the cost factor: renting space, renting equipment,and hiring an on-site instructor, or contracting out the training to another facility who will manage the whole process. And that's in urban centers. Those companies with offices in remote urban locations have to figure out their costs for employee travel. It can get pretty frightening. Enter Siri. Now, instead of a week-long trip somewhere or (worse) employees doing online courses that are pretty much inflexible and static (much like you mentioned in your blog), they can take a few minutes here or there and get some quality training with an AI interface that can speak their language - so to speak. Additionally, the user doesn't have to figure out what apps they'll need to accomplish anything at all - because Siri works seemlessly, behind the scenes, to provide the information and prompts required at any given moment. For sure, this technology is in its infancy - and really can't or shouldn't be compared to earlier attempts at voice recognition. But the evolutionary step represented by Siri seems pretty clear. Things won't be the same ever again.